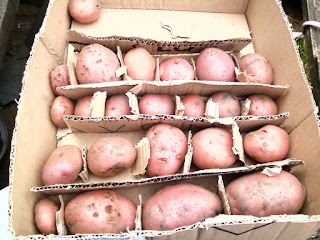 We have a lot of potatoes! Every year, assuming they don't get blight, we have our own potatoes until well into the New Year, sometimes until March. In fact this year we only bought one sack of potatoes (from a farm on the Yorkshire Wolds near Fridaythorpe) to last us until we had our own from July! In order to keep our potatoes in store successfully, I take quite a bit of care with the packing. 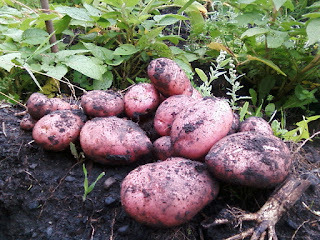 First, I allow the potatoes to dry a bit on the soil as I dig them up. Then, when I get them back to the house I clean them up with a old teatowel, and sort out any that won't store (there's always one or two that end up chipped with the fork no matter how careful you are, and there's a few with holes in - red ones don't get as many holes as white ones in our allotment). Then of course cover them up with cardboard and store them in a cool dry place. And number the boxes so you know which to use first!